San Francisco watershed. Imagine the possibilities. If you believe what you read in the newspaper, there’s a move afoot to open roads in the San Francisco watershed, but don’t hold your breath. It will be years, maybe decades, before it happens. 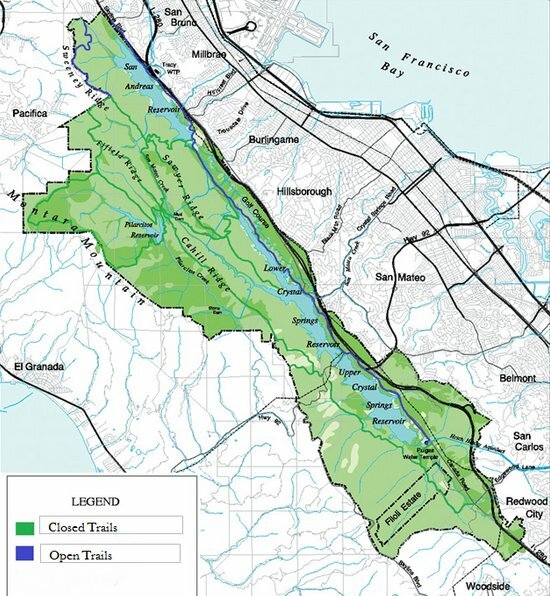 The 23,000 acre parcel bordered by Hwy 92 and Interstate 280 is managed by the San Francisco water department, but the federal government and San Mateo County have a say in any move toward public access. Currently the only way you can go there is on a docent-led tour, legally that is. Back in 1980 I rode through the watershed with Dave McLaughlin, an indiscretion I will long remember not for getting away with it, but for the beauty of Fifield-Cahill Road and the original Pilarcitos stone dam. Note that the map says it’s a trail, but don’t be fooled. It’s a fine dirt road and it’s used by maintenance vehicles all the time. Back then I was working at Palo Alto Bicycles and had just started going on Sunday rides with Jobst Brandt, who had a unique riding style that I immediately found appealing. He had a following of bike racers, for the most part, who also enjoyed riding their racing bikes on dirt roads and trails in the Santa Cruz Mountains. Jobst rode everywhere, public or private; it didn’t matter. He grew up in Palo Alto at a time when the sight of a bike on a dirt road seemed downright crazy. The mountain bike, even in 1980, had yet to become a fixture. I had been studying topographic maps of the area and had my eye on riding through the SF watershed, something not even Jobst had attempted. I’m not sure why. Maybe he didn’t want to take a pack of riders into harm’s way. Dave was more than willing. Still a teenager, he had a special talent on the bike that would take him to numerous victories on the racing circuit. We both knew about Old Cañada Road, which ran behind the Filoli estate, and where we rode on occasion. I noted on my rides on Hwy 92 a rock quarry near where Old Cañada Road meets 92. The topo map showed a road leading into the watershed. Dave and I headed out from Palo Alto on a beautiful fogless day, probably in the early fall after bike racing season. It was easy to get over the fence, and once inside we quickly found our way onto Cahill Road. How we wound up at the old Pilarcitos dam is lost in the fog of time. Here was a dam made of bricks nestled in a steep canyon, surrounded by dense stands of cypress, Douglas fir and redwoods. I recall tall trees with lots of hanging moss. It looked like something out of Jurassic Park. We couldn’t get over the pristine condition of the area, with only an incredibly well maintained dirt road to show that people ever visited here. From the old dam we made our way past the much larger Pilarcitos Reservoir where we saw the water department’s impressive vacation house and other public works. At some point the dirt turned to pavement. We didn’t have any idea where we were headed, but we continued north, figuring we would come out near Skyline Boulevard eventually. That’s exactly what happened. We exited at the north end of San Andreas Reservoir on a fast downhill. As fate would have it, water department officials had just opened the pearly gates (they must have known we were coming) and we quickly sped by onto public roads. When you look at it from the perspective of the SF water department, there is nothing but downside to opening the area. Would you want to have to deal with the public and the inevitable hassles? Of course not. Public agencies have the burden of making things “safe.” In our litigious society though, there is no such thing as safe. Think of all the items that need to be addressed: parking, enforcement, restrooms, signage, on and on. I have a different take on open space. Open it and don’t provide facilities. Take down the signs and let people roam. Maintenance crews can enforce. I just want to ride my bike and enjoy the scenery. That sign is what all private property signs should say. The world would be a better place for it. This entry was posted on February 12, 2015 at 7:54 pm and is filed under Once Upon a Ride, Ride reports. You can follow any responses to this entry through the RSS 2.0 feed. You can leave a response, or trackback from your own site. I agree completely about what the ideal should be—access “at your own risk” but no bother with facilities or maintenance. This is more or less the Marin Water District’s policy on their watershed. What the PUC is proposing is not ideal, but it’s vastly better than the current system. I’m more optimistic about the timeline here. They’ve set a goal, in writing, of December 2016 for access (by annual permit) to Fifield-Cahill Ridge, which is also the estimated completion date for the trail paralleling Skyline south of 92. The PUC’s attitude has, I think, genuinely changed recently. Tim Ramirez, one of the watershed managers, is supportive, and, perhaps most importantly, several SF and San Mateo supervisors are putting pressure on them. A few of us who have been working on this issue are going to meet with Ramirez in the next few weeks and give our responses to their proposal. We’re going to push to get Whiting Ridge opened ASAP (they’ve agreed in principle to open it, but no timetable yet), as well as Pilarcitos Creek Road and Old Canada. Maybe one day. Inch by Inch we might actually be able to let the public enjoy these spaces. I believe that the sign on Overlook Road your refer to was the result of an agreement between the Open Space management and the local residents to allow access to Monte Sereno in return for road maintenance. I’m interested in learning facts. Is this a fact? I have no idea. I’ve read online about issues with access to Overlook Trail (MROSD) and Aquinas Trail. I know for a fact that there is a sign on Canon Road that says no bikes. I rode on Overlook Trail and upon exiting saw the home-made sign. I’m willing to accept that the roads are private, but a no bikes sign is silly. What about noisy motorcycles? There was a gate on Canon Road years ago, since removed. It’s impractical to gate all the private roads up there since so many people use the roads for construction, PG&E, trash pick-up, etc. I think the “use at your own risk” sign is a decent compromise. I was thinking of Sheldon Road. A half mile up is access to Aquinas and the OS. I read on line last year about the road maintenance arrangement. I can look for a reference.